Language: English is the official language of Mauritius, but the most widely used is French and the local dialect, Creole. Hindi, Urdu and Chinese are also spoken. Health: No vaccination certificates are required for entry into Mauritius, unless travelling from a country infected by yellow fever or where yellow fever is classified as endemic. Typhoid and hepatitis vaccinations are recommended. Medical facilities are good and free in public hospitals, but private clinics are expensive and medical insurance is recommended. 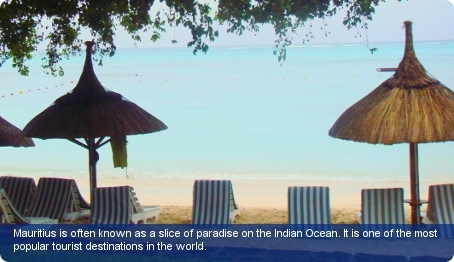 Tipping: Tipping in Mauritius is entirely discretionary. Customs: Homosexuality is illegal in Mauritius. Penalties for drug trafficking and use are severe, and any personal medicinal drugs should be covered by a prescription. Scheduled drugs, such as psychotropic preparations (e.g. tranquillisers, hypnotics), narcotics (e.g. morphine) and other strong painkillers require by law authorisation before import. Business: Business hours can vary though are usually from 9am to 4pm Monday to Friday; some businesses are open for a half-day on Saturdays. Communications: The international access code for Mauritius is +230. The outgoing code is 00 followed by the relevant country code (e.g. 001 for the United States). City/area codes are not required. The whole island is covered by mobile network; the local mobile phone operators use GSM networks, which are compatible with most international operators. Handsets and SIM cards can be hired at the airport. Internet cafes are widely available. Duty Free: Travellers to Mauritius over 16 years do not have to pay duty on 200 cigarettes or 50 cigars or 250g tobacco; 1 litre spirits and 2 litres of wine, ale or beer; perfume and eau de toilette for personal use. Prohibited items include sugarcane and fresh fruit from parts of Asia. No dogs or cats from 100km radius where rabies has occurred in the past 12 months are allowed into the country.